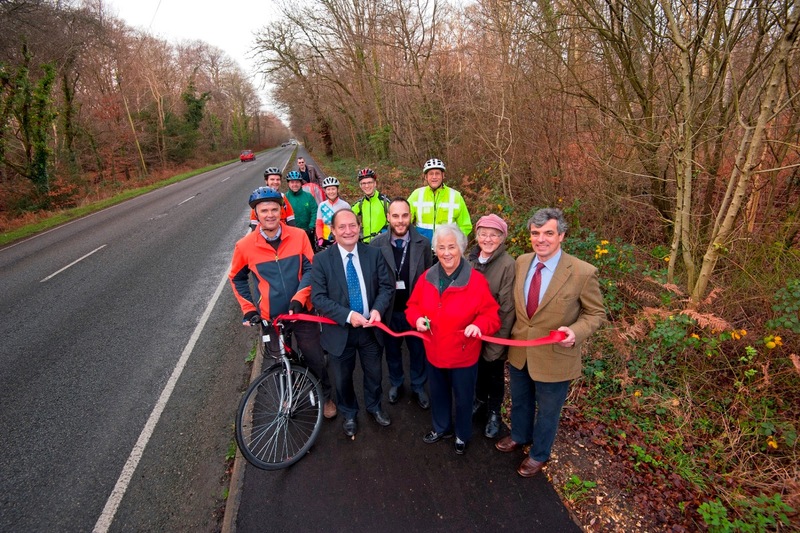 A vital cycle route linking Southampton, Totton and Ashurst with the heart of the New Forest National Park has been upgraded. New Forest National Park Authority (NPA) member and New Forest District Councillor for Lyndhurst Pat Wyeth officially opens the Ashurst to Lyndhurst route with local cyclists and (front left to right) NPA member David Harrison; Hampshire County Councillor (HCC) and NPA member Keith Mans; HCC Highway Engineer Steve Eleftheriou(correct); NPA member Sally Arnold; NPA Chairman Oliver Crosthwaite-Eyre. Based on feedback from cyclists, the 3.5km shared route along the Southampton Road from Lyndhurst to Ashurst and 1km of route either side of the A35 within Totton have been made more robust and resurfaced, making it suitable for all bikes as well as pedestrians. Replacing the former gravel surface on the path next to the busy A35 with the smooth tarmac surface means commuters, students and people cycling for pleasure are now able to use the popular route away from the danger of traffic. The work was paid for with £325,000 from the New Forest National Park Authority’s £2m cycling fund from the Department for Transport, with additional funding from Hampshire County Council. The upgrade has been delivered through Hampshire County Council’s Operation Resilience programme to improve the robustness of the county’s highway network. New Forest National Park Authority member and New Forest District Councillor for Lyndhurst Pat Wyeth said she had been campaigning to improve the route for years. She said: ‘Only people with tough mountain bike tyres were able to use the gravel surface previously so people commuting or using road bikes with thinner tyres had to either risk a puncture on the path or dodge the many lorries and cars in the road. The route also forms part of the National Cycle Network Route 236 from Southampton to Lyndhurst. Pioneered by active travel charity Sustrans, the National Cycle Network celebrates its 20th birthday this year.